Whether cooking a chicken soup, sauce, gravy, or casserole, the chicken base can be the start of a healthy recipe packed with flavor. A lot of people confuse chicken base with its counterparts, such as chicken stock, broth, and bouillon. However, each of these flavoring concoctions have their own unique method of preparation and purposes. Chicken base can be either homemade or bought prepackaged. What Is The Difference Between Chicken Base, Broth, Stock, And Bouillon? This is the most basic form of chicken-based flavoring liquid. It's made from simply boiling any part of the chicken meat, whether it's the breast, thigh, wing, etc, in water until the meat is done. Chicken stock is more nutrient-dense than just chicken meat broth, and its appearance looks more cloudy than broth from just chicken meat. The difference comes from the chicken bones. It's made from boiling the chicken meat and bones in water. As it's boiled, the marrow and broken down bits from the bones create a more heartier, potent flavor. Plus, research is showing that the vitamin and mineral content from bone marrow and cartilage within chicken stock gives it innumerable health benefits. Chicken bouillon is produced from chicken stock that's been dehydrated and turned into a powder. The powdered stock is then often compressed into a yellowing-brown cube. It usually contains a significant amount of added ingredients and preservatives that you should be aware of before using it. Bouillon cubes are a no-go for many people, such as those on a salt-restricted diet or that have sensitivities to MSG or gluten. This form of chicken flavoring also originates from chicken stock. The difference is in the length of time the chicken parts are cooked. Bases are generally the most nutrient-dense and rich form of flavoring. The chicken stock is slowly simmered for an additional number of hours until the ingredients melt into a reduced semi-liquid state. When room temperature or chilled, it resembles a gelatin state. Chicken base is a fantastic ingredient for recipes because it has the same potent chicken flavor that people love to use bouillon for, but bases usually don't have all the added salt and preservatives that manufactured bouillon cubes frequently contain. This is especially true of the homemade chicken base because you directly control what goes into making your base. Chicken base recipes are super simple to make. The only caveat is that you must have time to let the chicken stock reduce into a base. That said, chicken base keeps easily in the freezer and fridge so that you can get multiple uses out of taking the time to make it once. Step One: In a large stock pot or Dutch oven, combine the ingredients and any/all optional ingredients of your choosing. Step Two: Bring to a rolling boil before covering and reducing heat to a low simmer for two hours. Step Three: Remove the chicken from the pot and allow to cool enough for you to dice the meat into small cubes. Step Four: Return the diced meat to the liquid, cover, and continue to simmer until the chicken has melted into the liquid and the liquid has reduced by two-thirds. Step Five: Once reduced, you'll place the base into the fridge so that it can cool enough for you to skim the fat off the top. You'll easily see the two distinct layers when the base is cold. Step Six: This is an optional step for a smoother base. You may now strain the base through a cheesecloth. This simply makes for a smooth consistency when you go to use the base. Step Seven: Either store the finished chicken base in the fridge or freezer or immediately use it for recipes. It may be easier to make a large batch and separate the base into individual storage containers for future uses. You can use an ice tray to perfectly portion out frozen cubes of the base to be put into freezer bags. Simply pull a few cubes at a time out as you need them. The frozen homemade chicken base remains good for months. Refrigerated base stays good for around a week. Chicken base can be made with nothing more than bony chicken parts and water. From there, any seasonings and vegetables you like can be added for an even more flavorful base. Pick optional ingredients based on the types of recipes you'll be cooking. Add some cilantro, for example, if you're planning to try out some Mexican chicken recipes. Use your chicken base to make flavorful recipes like chicken and dumplings, chicken gravy, chicken soup, holiday dressing or stuffing, or chicken and rice casserole. You can also use the base to flavor pastas and rice as they cook in water. You don't have to use an entire chicken that has both dark and white meat. You can select which parts you'd like to use to make your base so long as you use both the meaty and bone portions of the chicken part. What If I Don't Have Time To Make A Chicken Base From Scratch? While a homemade chicken base does give you the added benefit of controlling the exact ingredients, many people simply don't have the spare hours to devote to making it from scratch. In this case, you can buy a prepackaged chicken base that's already done all the waiting and work for you. A word of caution, however, is that you should carefully look at the label and ingredients as you consider your purchase. A good rule of thumb is to ensure that chicken is the first ingredient listed on the label, which means that it's the main ingredient of the product. The FDA requires manufacturers to list ingredients "in order of predominance" so that consumers can make informed decisions. Also, do pay attention to additive amounts if you're on a special diet or want to be mindful of ingredients like sugar, cholesterol, and salt. Some prepackaged base, broth, stock, and bouillon products can contain half that daily allowance in one serving. 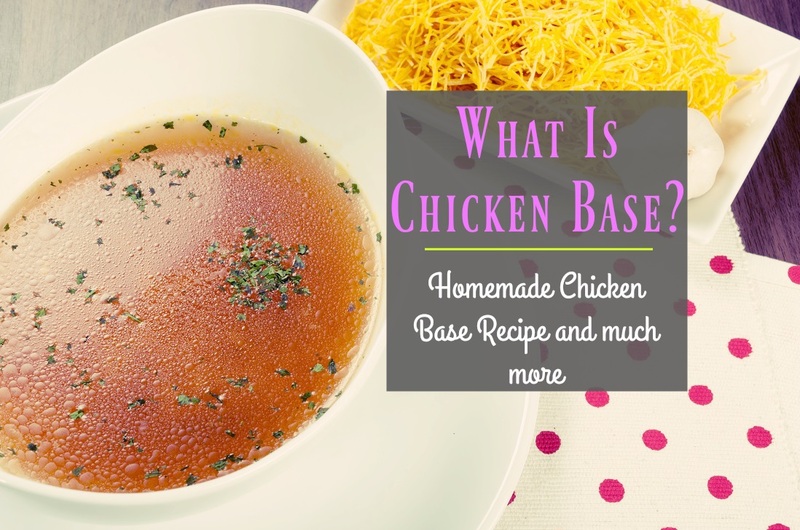 Not so long ago, the chicken base was most commonly something used in bulk by the commercial food service industry as they served mass quantities of people and needed products to help them make semi-homemade food quickly and cost-effectively. Today, a number of manufacturers are packaging chicken base in smaller packages for individual consumers. The product can be found on the shelf in a number of super-sized grocery stores and specialty food stores. It's also sold online. Online retailers offer those unfamiliar with the chicken base a unique opportunity to read customer reviews and leisurely peruse the food labels. It's also helpful at finding the chicken base products offered by smaller and specialty manufacturers. As to which chicken base product is the best, that decision is based on multiple factors, such as dietary needs and how you'd like to store the product. Stores unopened at room temp and in the fridge after opening. Use by adding spoonfuls to recipes as per serving guide; a single resealable container provides multiple servings. Very smooth, or non-gritty, base. 16 oz product with 1 tsp of base equaling 8 ounces of chicken stock. Resealable packaging, and manufacturer says it keeps in the fridge for up to a year. It does come in an organic option for around the same price. A con is that it does contain MSG and soy and wheat products. Compared to other bases, Minor's has a great flavor, but another con is that it doesn't dissolve as smoothly as other brands. Over 680 mg of sodium is also a thumbs down. Organic ingredients that are 90% sourced within the USA. It comes in powder form with a resealable container, which does not have to be stored in the fridge. Only 216 mg of sodium. "Organic potato flour" is the first ingredient, with "chicken fat" being the seventh ingredient listed. As mentioned earlier, this means that the chicken of the chicken base isn't the primary ingredient. A con is that this product comes off as more starchy-tasting to some consumers. In closing, the art of making flavoring agents is one of the first techniques taught in professional culinary school. This is because cooking is often a layering process, and from a single foundation, such as chicken base, thousands of unique recipes can be created. Homemade is always ideal for ingredient control in your chicken base, but prepackaged options are available for those who need a quick helping hand. Just be sure to carefully assess the labels to ensure you're getting a product that best suits your standards and dietary needs.